Patricia Ann Browning didn’t see the deer standing in the middle of the road until it was too late, not that it would have mattered. For retired NYPD Detective, James Maguire, the pieces of his life were finally starting to fall into place. He was running his own lucrative private security firm catering to Fortune 500 companies and had just met Melody Anderson, a highly successful business woman from Long Island's posh enclave of Southampton. Everything, it seemed, was looking up. That was until the morning newscast reported that his former high school flame was missing from a one car accident on a rural country road in upstate New York. Arriving back in his old hometown Maguire must come to terms, not only with his past, but the fact that no one seems interested in pursuing the investigation into Patricia Browning's disappearance, including the missing woman’s husband, the local sheriff. As Maguire struggles to put the clues together in time, he is drawn deeper into a game where people are as expendable as pieces in a chess game and the only goal is to take down the king. A crown Maguire unwittingly wears. Welcome, Andrew. Can you tell us a little about yourself? Well, I’m married to an amazing woman, Nancy, and we have four adult children. I was born and raised in the Queens section of New York City and spent twenty years with the NYPD before retiring in 2005. We moved out west, to Central Illinois, and I enjoyed retired life for a bit, but then I started to get restless. I went back into law enforcement in 2010 and spent two years as the chief of corrections for a local sheriff’s department. In 2012 I re-retired and my wife encouraged me to try my hand at writing. My first book, Perfect Pawn, was released in 2013 and I followed that up in 2014 with the release of the sequel, Queen’s Gambit. The first time I began writing was when I wrote the original chapter of Perfect Pawn back in 2000. It actually started out as a dare from my wife. Both of us are avid readers. One evening she commented that writing a book must be very hard. Silly me responded that I didn't believe it was. My reason for this belief was that I'd just spent the last decade writing investigatory reports on criminal investigations. After the first dozen or so you looked for ways to keep the reader’s attention. The thesaurus and I became quick friends. You also have to recall a lot of details from the scene. Writing for me is like watching a movie in my mind. I see the scene play out and then I write it. At the time, she encouraged me to continue writing, but then 9/11 occurred and our lives were thrown into upheaval for a few years. Can you tell me a little bit about your books? 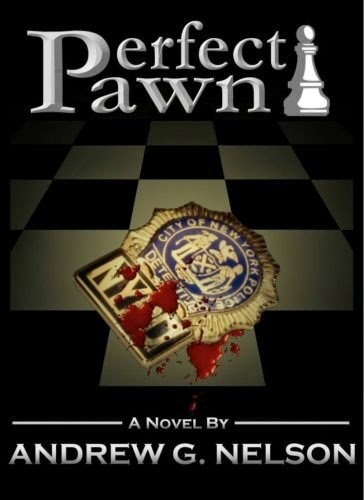 My debut novel, Perfect Pawn, features a retired NYPD detective, James Maguire, as the protagonist. I grew up reading novels, by authors such as Tom Clancy and Frank Herbert, which had rich character development. In Perfect Pawn, Maguire returns to his childhood home to help search for his missing high school sweetheart, only to find that no one, not even her husband, who is the county sheriff, is interested in finding her. Soon Maguire realizes that her disappearance was just the opening move in a much larger game and that the next target might just be him. Queen’s Gambit takes place a short time later, and brings Maguire back in a new role and facing an even greater threat. In writing the characters I developed a deep affinity for each of them, so the series has been an opportunity for me to expand them and show them in a variety of situations, good and bad. My latest novel, Small Town Secrets, is a departure from my James Maguire series. The books protagonist is Alex Taylor, a former NYPD sergeant, who was forced to resign from the department do to a drinking problem and ends up as the chief of police in a small New Hampshire town. When a woman’s body turns up in the Lake, Taylor begins to think the murder might have been a cover-up for the towns much bigger secret. This book actually started as a short story, which I was going to release in between the Maguire books. When my wife, who is always my first beta reader, read the book she fell in love with the dysfunctional Taylor and asked me to expand the story. So it went from Novella to Novel, and I have just begun work on the sequel. One thing that cops have, are stories. Some are funny, most are sad, and others you even keep to yourself. But in the middle of that is a whole host of ideas and characters. A lot of people have asked how much of Maguire is me and I say that he is a composite of myself and others. A lot of the situations, and locations he finds himself in, are based on things that happened in real life. This is true for some of the other characters as well. However, moving forward, the characters will definitely morph into new roles and relationships based on the unfolding storyline. It would have to be Perfect Pawn, because I think if you miss that one, you miss a lot of the backstory on James and the other characters. As I said earlier, I’m a big proponent of characters with depth. Too often I have read stories where I go, I really like that character and would love to know more, and yet the author lets them languish. Perfect Pawn lets you know the reasons why certain things occur later. That’s really tough. I think between Maguire and Taylor I have two great protagonists who bring two completely different personalities to the table. Maguire is the calm, cool and collected professional and Taylor is more the sarcastic, edgy type, struggling to overcome their demons, and operating in what I call that ‘gray’ zone. Not knowing where I was going (Laugh). When I did the original chapter it was just painting a particular scene. That was easy. When I began to write the actual book I had something like: His love goes missing, he tracks her down, saves her, and they live happily ever after, the end. It was a romantic notion, but let’s just say that it didn’t work out so well. Being a cop, I know firsthand that real life is often very cruel. So I took a step back and thought what if the white knight doesn’t make it in time, or what if the bad guy wins. Then I began to write the story that ultimately made it into print. First and foremost is to write a story that elicits a strong response from the readers. The last thing I want is a lukewarm reader. You can love a character or hate a character, but I want there to be that emotion. It’s my goal to have you pick-up one of my books and the next time you look its two o’clock in the morning. I want it to be a struggle between reading the book all night and having to get up for work the next day. Well, I just finished the rough version of the 3rd Maguire book and will be going back over it to tweak the story line a bit and add some additional dialog on some secondary character. I’m just started working on the 2nd Taylor novel, which I am very excited about. Changing back and forth between the two different protagonists allows me to clear my mind between books and come back refreshed. Write! I know that may sound overly simplistic, but so many people have great ideas for stories and yet never put pen to paper. Will everyone love your work? No, but you’ll find your niche if you persevere. I have a copy of a letter that was written to Paul Hewson back in 1979 from an executive at RSO Records. They informed him that the demo tape he sent was ‘not suitable’ for their company. I don’t know what the record executive over at RSO is doing these days, but I certainly know what Hewson, you may know him as Bono from the group U2, is doing.